Herbs prepared in vodka, brandy, or other liquors, or vinegar, are called tinctures. Tinctures can be used internally or externally. Herbs prepared in rubbing alcohol are called liniments. Liniments are for external use only. Nourishing factors found in herbs, such as vitamins and minerals,are extracted into tinctures, but, since only small amounts of tinctures are taken, only small amounts of these nutrients are ingested. 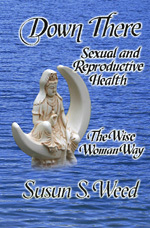 The Wise Woman tradition focuses on the excellent nourishment available in wild foods and herbs to support the body's ability to repair and heal itself. Thus, water-based preparations are usually my first choice as herbal medicines, but I use tinctures when I travel, when I need immediate medicinal effect, or when I am dealing with rare, horrible tasting, or expensive plants. People who refrain from using all alcohol can still take tinctures. Since alcohol-based tincture doses are small (20 drops is the average dose) and diluted in water, the taste and effect of the alcohol is virtually non-existent. Many alcoholics indicate that herbal tinctures react like medicines in their bodies, not like alcohol. To further mitigate the effect of the alcohol, let it evaporate somewhat by adding the tincture to some water and letting it sit exposed to the air for a few hours. Dosage: Tincture dosage is widely variable. Experiment with caution and consult references. The best tinctures are made from fresh plants. These tinctures are so far superior to commercial tinctures made from dried plants that they almost appear to be different medicines! Identify and pick the plant parts you desire to tincture. Look through the plant material and discard any damaged parts. Do not wash any part of the plant except roots, and those only when necessary. Chop the plant material coarsely, except flowers and delicate plants. Fill a jar to the top with the chopped plant material. Label the jar with the name of the plant, the part of the plant used, the type of the spirit used, and the date. Example: Shepherd's Purse, the whole plant in flower, 100 proof vodka, 12 May 1985. Allow plant and alcohol to mingle together for six weeks or more. Decant the tincture and it is ready to use. Most dried plants are unsuitable for tincturing, with the exception of dried roots, resins, barks, and leathery leaves such as Rosemary, Uva Ursi, and Wintergreen. Powdered herbs are never suitable for tincturing. Put two ounces of dried root or bark in a pint jar. Add ten fluid ounces of 100 proof vodka or other spirit. Decant the tincture after six or more weeks. Vinegar tinctures are not very potent, don't last for as long as alcohol tinctures, and have an aggravating tendency to rust the lid onto the tincture bottle. A few medicinal herbs, such as Lobelia and Wintergreen, are commonly tinctured in vinegar. Many garden herbs, such as Tarragon, Oregano, Chives, and Rosemary, are put up in vinegar. If you make full strength tinctures with these seasoning herbs, instead of the weak brews you've probably been making, you'll be thrilled with the marinades and salad dressings you'll be able to create. Fill your jar to the top with room temperature, not boiling, vinegar. Use apple cider vinegar, wine vinegar (or wine), rice vinegar, etc., but no white vinegar. Use cork or plastic to cap all your vinegar tinctures. A piece of waxed paper or plastic wrap between the jar and the metal lid is acceptable. The usual dose of a medicinal vinegar tincture is one teaspoon per hundred pounds of body weight. In cooking, use your vinegar tincture just as you would regular vinegar. Heavenly! Choose a jar that will be filled to the top by the plant material and the alcohol; if an empty "head space" is left, some of the plant material oxidizes and spoilage is more likely. For extra potency, put up tinctures when the moon is dark or new; decant them when the moon is full. This helps oils, too. Keep your tincture in a place where you can watch the interesting changes in color, and occasionally poke your finger in to get a taste. There is no need to shake it daily or keep it in isolation or the dark. Avoid strong direct sunlight, though. Occasionally tinctures will ooze; protect your furniture. Although the tincture is ready to use in six weeks (that's one reason why you label it with the date—so you know when it is ready). there is no need to decant it then. I have kept some herbs sitting in their vodka for years with no problems or decrease of potency. To decant the tincture, just pour off the alcohol, put it into a brown glass bottle, and cap tightly. You will notice that the plant material is still wet. Put small handfuls of it in a cotton cloth and wring, hard! (This also builds good muscles in the hands.) Add this extra tincture to your bottle. If your tincture is made from dried roots, much of it remains in the roots after decanting, because dried plant material absorbs alcohol. There are various ways to retrieve that extra tincture. The easiest way is to put the plant material through a centrifugal juicer (minus the cutting blade) such as Acme or Braun. If you don't have access to a juicer, you can use a salad spinner. Wringing is also possible. Label the bottle of decanted tincture with the same information you put on the original tincture. It is advisable to respect the potency of herbal tinctures; although it is unlikely that ingestion of even entire ounce bottleful could kill someone, the likelihood of unsettling effects from such a large dose is great. I prepare nearly all of my tinctures in 100 proof vodka. Other herbalist friends wouldn't think of making a tincture in anything other than brandy. Pharmacists and homeopaths make their tinctures in pure grain alcohol (198 proof). I suggest 100 proof vodka because it is readily available and fairly inexpensive, clear, and exactly half water and half alcohol. Most books which give recommendations on dosages of tinctures assume that the tincture your are using is a 50% tincture, that is half water and half alcohol. Preparing a tincture in 100 proof vodka eliminates the need to do fancy math to determine the correct dose. 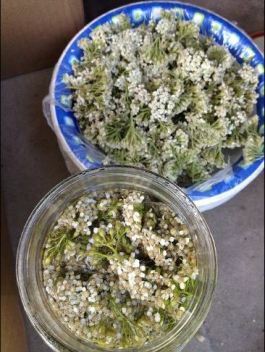 * Tincture one ounce fresh plant material in approximately one ounce spirit for six weeks. * Tincture one ounce dried plant material in five ounces spirit for 6 weeks.